Life’s good when you’re eating pink (naturally). 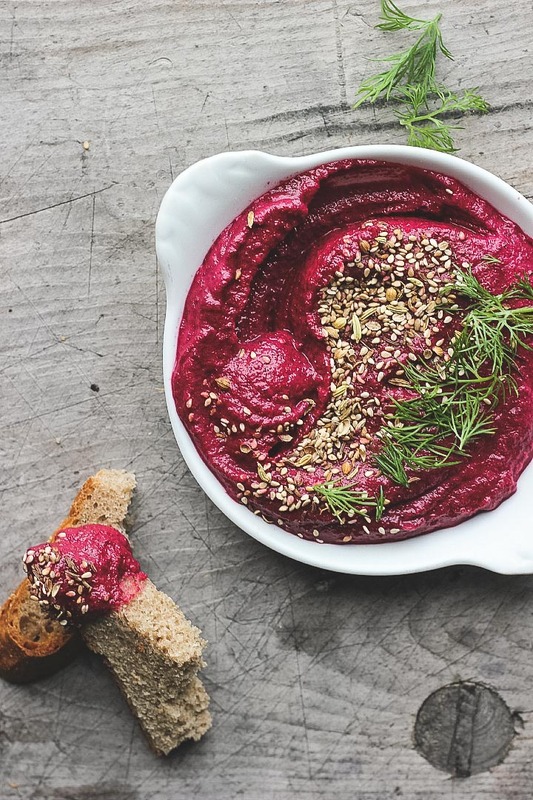 Beets, lentils and tahini – a few of my favorite things blended into one delicious pink bite. Hummus is one of my favorite snacks. Scratch that – hummus is one of my favorite things to eat, anytime. As much as I love making nice meals for dinner and using up different pots and pans, most of the time I am just as happy with some hummus on toast. And a hummus like this, loaded with nutritious beets and lentils – well thats a dinner idea I can really get into. My mom and I share the same love for food. Good food. All things food. Collecting recipes from magazines, scanning through food blogs, and just chatting about different things we’ve made lately. Sharing thoughts on food and cooking is one of my favorite past times, come to think of it its what most my conversations with my closest friends always turn too. Since I’ve been back home I’ve shared many meals with friends and family, casual dinners with wine and great food. Its been really good – soul good. I’ve got a full belly and an even fuller heart. This hummus has been made twice now with my mom, varying the recipe a little bit each time. We both agreed that roasting the beets adds a ton more flavor rather than boiling them with the lentils – so that’s the recipe I’ve chosen to share here. A big tub of pink goodness. A big hug to the ones I’ve shared it with. So colorful and flavorul! Serve with sliced veggies, crackers or pita wedges. Adapted from Sarah Britton for Vegetarian Times Magazine (June 2013). Peel and chop the beets into small chunks, toss in a tiny bit of oil and bake on a baking sheet for about 20-25 minutes of until tender. Remove from the oven and let cool. Finely chop the garlic in a food processor and then add the tahini, oil, lemon juice, zest and salt and process until smooth. Add the lentils and beets and blend on high until smooth (add water to thin it out if necessary). Season to taste. *1/2 cup uncooked lentils, soaked for an hour or overnight and then cooked on the stove top in water until tender will yield 1 and half cups of cooked lentils. I used green lentils, but the original recipe called for black beluga lentils, so use whatever is available to you and follow the package cooking instructions. Best when lentils are well cooked and not al dente. If you are in a rush, precooked packaged lentils will do the trick but it might be best to add the salt at the end (if needed) since they can often be high in sodium. Wow, Jodi, what a great sounding hummus! I was kicking around the idea of a lentil hummus as well after sprouting way too many lentils. Was thinking about blending with some chickpeas, this is great validation that it should work. Thanks Tony! This would be a great way to use up those sprouted lentils :) I’d love to know how it works out if you do try it! This is a beautiful recipe! Thanks for sharing! wow, is this stuff good! will definitely be a go to spread & dip. thank you!